We woke up early the following day for our trip to Sabtang. Tita Remy has arranged for the jeep to pick us up at Novita house at 5:30 am, for the ride to the Ivana port, where we would ride a faluwa to Sabtang. At 5:20am, the jeep was waiting outside the gate. Because there aren’t that many people in Batanes, public transport aren’t as regular as it is in Manila, so we either take this jeep to Ivana, or wait until several hours later for the next one. 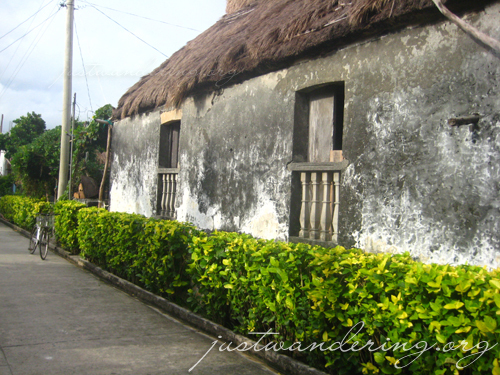 The streets of Batan island were dark, specially in areas where there aren’t any houses. Road improvement were ongoing, and the roadworks were marked by lanterns strewn along the cordons that line the pavement. Soon we were rewarded with a gorgeous pink sky that marks the start of a new day. This beautiful sunrise raised our spirits, taking it as a sign that we’re going to have another sunny day in Batanes. bamboo poles on the side to help it keep its balance. Because the waters between Batan and Sabtang are very rough (it’s where the Pacific Ocean and the South China Sea meet), the faluwa is constructed in such a way that it will ride the waves, rather than go against it. The boatman arrived and he went onboard to prepare the small boat for sailing. More people arrived and soon enough, we set sail for Sabtang. The sea was still fairly calm early in the morning. I felt some dread as I look out across the sea towards Sabtang — the boat was rocking in a way I’m not used to, and it looks like there’s rain coming our way. Luckily, it was just a slight drizzle, and it passed us quickly enough, but it did not help ease my queasy stomach. I heaved a huge sigh of relief as we docked into Sabtang. Due to the pounding surf, disembarking from the faluwa is a rather clumsy (and scary) affair. Thanks to my urgent need to find a rest room, I was able to jump out of the boat in one try and I quickly trotted off to the toilet and said goodbye to my breakfast. Relieved of my seasickness, I was back in high spirits and looked forward to the day’s exploration of Sabtang island. We rented a jeep for Php 1,500 for a half day tour. 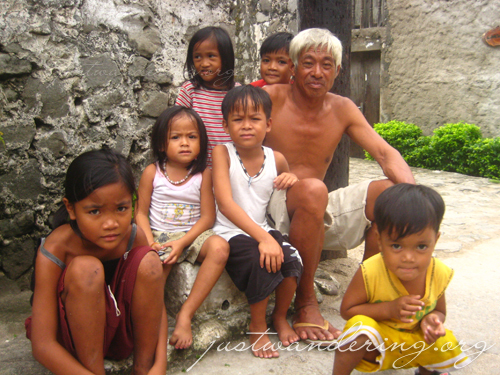 We drove to several communities, including the towns of Savidug and Chavayan. Sabtang towns are small, and far in between. Stone houses line the strip of national highway that goes through the town. As we go down to take pictures, we were just given a cursory glance by the residents already used to tourists flocking to their town and taking pictures of everything they set eyes on. The Ivatans are very accommodating, and we feel their warm welcome as they greet us good morning as we walk around, even stopping to chat with us. After the two stops in Savidug and Chavayan, we headed back to San Vicente for lunch. Stopping briefly to pick up our picnic lunch at RCJ’s Food Hut, we proceeded to the Nakanmuan Arc. 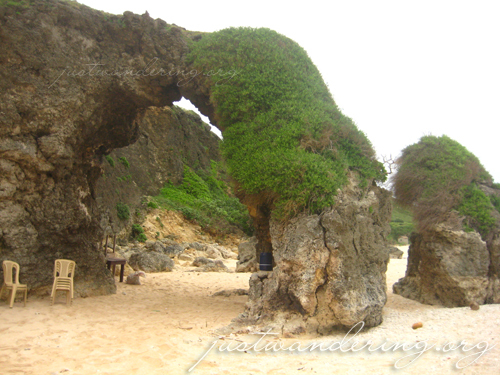 It’s under this beautiful natural arc that we had our lunch, right on the beautiful white sand beach of Sabtang. For only Php 250, we dined on Coconut crab locally known as Tatus, fried fish in sweet sauce, steamed sigarillas and rice, accompanied by fresh buko juice. Spectacular views, delectable food and great company, what more can you ask for? This is easily the best value meals I’ve ever had this year. Shortly after lunch, we raced back to San Vicente, to catch the boat back to Batan. Unless you’re staying overnight in Sabtang, tours around the island are limited only in the mornings. Due to the rising tide in the afternoon, there are no boats going to and from the island late in the afternoon. We missed the 12:30 boat back to Batan island, but luckily, there was another one leaving at 1:30. Unfortunately, by this time, it started to drizzle and the waves and the wind has picked up. We were lucky Dino brought a couple of Sea to Summit Dry Sacks that kept our cameras dry. Thanks with the heady smell of gasoline inside the faluwa and the rocking of the boat, there was an impromptu fish feeding session, courtesy of Marc and I. This trip to Batanes is gathering up a number of most memorable moments, and this particular boat ride is yet another one. I have experience a worse crossing in between Batangas and Puerto Galera in the middle of a storm, but I was able to keep my breakfast that time. Thanks to this faluwa boat experience, I’m not looking forward to go on another boat ride anytime soon. Everybody was relieved when the Ivana port came into view. Disembarking is another tricky maneuver, but similar to what happened in Sabtang, our desire to get out of that darned boat propelled us to get out quickly. There was a jeep waiting for passengers, and we hopped on, eager to go back to Novita house to change out of our wet clothes and rest. We were glad we left Sabtang when we did, because as soon as the jeep pulled out of the port, the rain poured. Plans for more sight seeing that afternoon was scrapped, as we were too exhausted (and sick) to be going anywhere. Plus, the rain was such a party poop. Nevertheless, it gave us the perfect excuse to take it easy and relax. 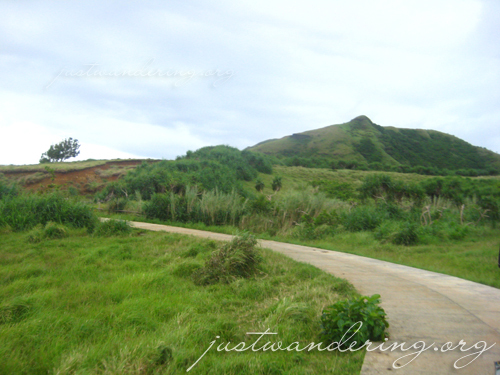 Did you know that you can fly to Batanes for as low as Php 5,800+? That’s right, with Seair’s FlySaver fares, one-way fares go as low as Php 35! That’s excluding taxes, of course. Book now, so you can have your own Sabtang adventure! Sea to Summit products are available at the Recreational Outdoor Exchange (R.O.X.) store in Bonifacio High Street, Global City, Taguig. wow! thanks for the tour. that’s a dream place. ill make sure that ill stay longer (one week) once i get to go there. Wow sarap naman. 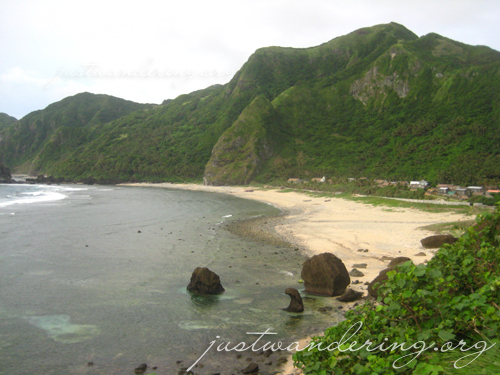 Sana maka pag travel-travel din ako balang araw…..
haha:) nice sceneries, this is where Iza Calzado and Ken Zhu shot there film for Batanes… it is a really cool place….. care to visit my site and exchange links???? thanks! nice blog anyway!